Well, readers, we're closing in on the end of 2016. I think for many of us, it will be gladly received. This has been a harsh year folks. I am guilty of being late on reviews. I accept that. I always have the intention to read, and review those books I request or that I agree to review. Well, this year I need to make good on some books. 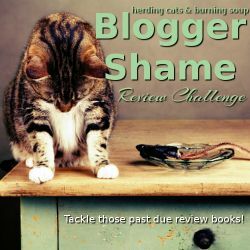 This is hosted by Hearding Cats & Burning Soup, and its contingency is that the reviews need to be 4+ old. We set our own number of books. I hope to read and review 10 books that have been awaiting review. DON'T JUDGE ME. Moving on. 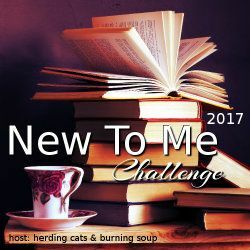 Next up is the eBook Reading Challenge! I have so many ebooks on Kindle, and iPad, and it's time to get to them. This challenge is being hosted by Book Dragon's Lair, and there are different levels. Because of the amount of ebooks I have, and already read, I am choosing the Gigabyte level which is 50 books. This one is the PopSugar Reading Challenge because again - fun. Psst...a better copy of the challenge can be found at the above link! Ah! I'm excited for this challenge too! (All of these of course, I mean, why else do them, ammiright?) We have to pick a prolific author and read 45 books from their backlist. Hence, all the books. 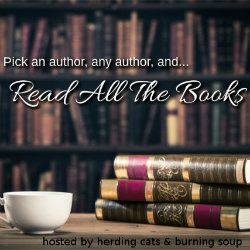 This is hosted by Hearding Cats & Burning Soup. I am stuck if I want to work on Gena Showalter's books, or Nalini Singh's. Or both? Hm. Another challenge because I'm obviously crazy. The goal is to read at least 12 MG/YA/NA debut novels. Monthly link-ups go up on the 1st of each month. ​Never too late to get started, right? RIGHT?? See what I've read so far below - click on image to read the review!